Melting gold typically involves sweltering furnaces and glowing, molten metal – but researchers in Sweden have now seen gold melt at room temperature for the first time. Eva Olsson and Ludvig de Knoop from Chalmers University in Gothenburg and their colleagues use electric fields to controllably melt tiny gold cones inside a transmission electron microscope (TEM). ‘When we decrease the electric field we can revert this disordered surface metal layer to its original crystalline form,’ says de Knoop. This controllable change might be used to control plasmonic processes that trap light at metal surfaces and can enable catalysis to enhance chemical synthesis. Researchers already use electric fields to convert gold directly from solid to gas. ‘It’s assumed that the structure is crystalline and ordered up to the point where there is evaporation,’ Olsson explains. 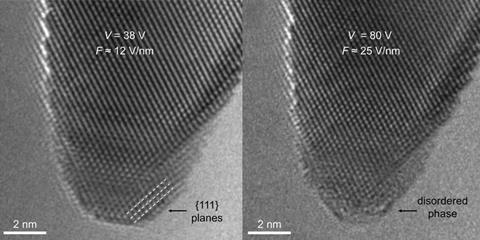 de Knoop had previously used electrical fields to study cold-field emission, which can provide electrons for TEM, from cone-shaped carbon nanoparticles. ‘I always had this dream that I wanted to observe actually ionizing atoms with atomic resolution,’ he says. In this study, the team turned to gold nanocones with a tip radius of around 2nm, produced by hole-mask colloidal lithography. They used a specially-designed sample holder to apply an electrical field to their solid, crystalline, gold surfaces in a TEM under high vacuum. The conical shape helps obtain very high fields with potential differences of billions of volts per metre, Olsson exlplains. ‘When the field reaches a certain critical value then there is a very thin surface layer that gets disordered: it melts,’ she says. At a suitable voltage the radius of the tip decreased from 2.3nm to 2.0nm as the outermost one or two layers melted. ‘The interior phase is crystalline and solid,’ Olsson stresses. Francesca Baletto from King’s College London calls the study stimulating, and says that she appreciates ‘the direct observation of reversible structural changes’. She adds that altering nanoparticle architecture in this way opens the path to non-trivial new physics including ‘the coupling between light and morphological changes of the metallic nanoparticle’. The Chalmers team is now exploring whether the same effect can be seen in other metals. Olsson adds that nanoscale patterning technologies like lithography might also reproduce the effect in other shapes. That could enable the controllability to be used not only in catalysis, but also in many areas of electronics and optical science.